Softcover, 128pp, 336 color photos/illustrations, ISBN: 9780890249574, by Aaron Skinner, published by Kalmbach Publishing Co. Overall Rating: 10 - a valuable addition to your hobby library. It wasn't all that long ago that the airbrush was something only artists used - and now it's considered an indispensable tool for any "serious" scale modeler. I bought my first one back in the early 1990's (still have it too - Badger 200) when I returned to the hobby. In just 20 or so years, the number and variety of airbrushes seems to have exploded. Do you need one? What kind? How do you use it? There's so much information and opinions around it's hard to answer any of those questions. Aaron Skinner does a pretty thorough job of it, though, in this book. 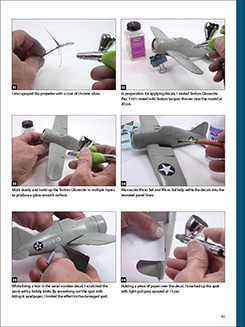 Mr. Skinner is currently the Senior Editor at FineScale Modeler magazine and a prolific author on hobby subjects. His latest book is divided into two parts: Introduction and Projects. The Introduction covers the tools, materials/supplies and basic techniques. The bulk of the book uses 14 different model projects to illustrate different techniques and finishes. 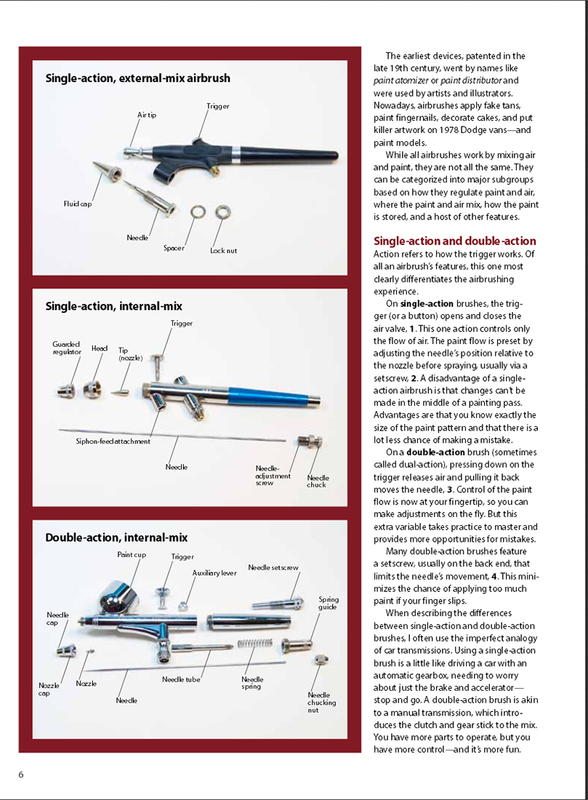 Choosing an Airbrush - the various types of tools available. Understanding the Basics - the interdependence of air pressure, paint consistency and distance from the surface being painted. Mastering the Tool - basic airbrushing techniques. Masking - various methods to block paint from going where you don't want it. 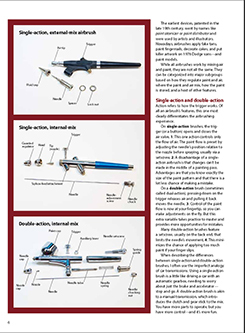 Maintenance and Troubleshooting - cleaning & storing your tools, followed by a list of common problems and their causes. Armor painting basics - laying down a simple finish of one, solid color, followed by very basic weathering. Airbrushing single color aircraft - a more involved project with masking and decals. Post-shading for a dramatic result - painting over the base color to make a monochromatic finish more "realistic". Pre-shading monochromatic finishes - the flip side of the preceding chapter, where tonal variation is done by painting before the base color goes on. Masking straight lines with tape - finishes where two colors meet with a sharp, straight border. Painting small scale ships - how to finish small, intricately detailed models. Achieving perfect gloss for cars - how to do a gloss finish, which may be the most difficult paint job to pull off (it certainly is for me!). 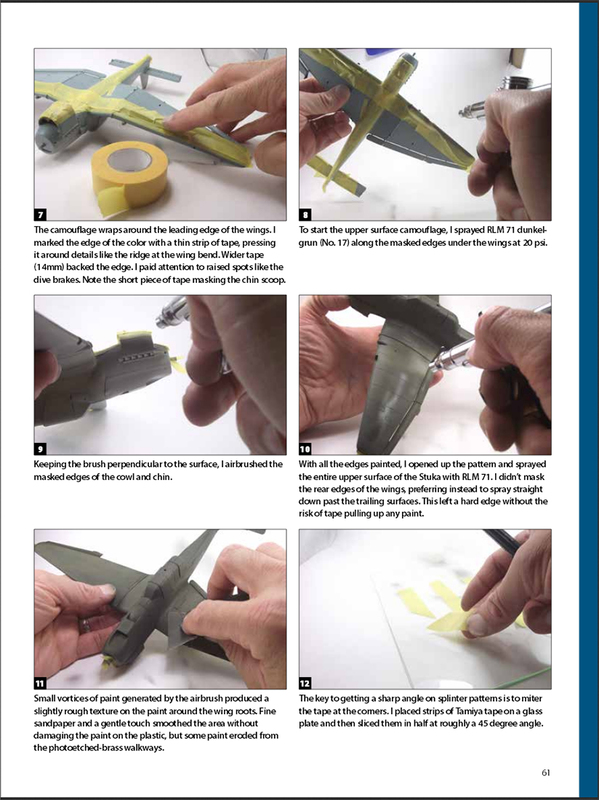 Cutting tape masks - masking a paint scheme made up of irregular or curved shapes. Create soft edges with raised masks - finishes with soft/fuzzy borders between the colors. Silly Putty produces sharp camo - masking odd shapes that require hard demarcations between the colors using Silly Putty. Poster putty leaves soft edges - similar to the preceding chapter, except that the demarcations are soft/fuzzy. Freehanding camouflage on armor - painting without masks. Mottling a Luftwaffe fighter - painting intricate patterns without masks. Airbrushing big-scale figures - tips for figures. Every chapter is lavishly illustrated with step-by-step photos and illustrations, in a style that will be familiar to readers of FSM. The text is clear, concise and easy to follow - and integrated well with the photos and illustrations. Surprisingly, there is no discussion of metallic finishes - but otherwise, it's very comprehensive in the types of finishes covered. I found the chapter on "Mottling" (a camouflage scheme made up of lots of small, irregular blotches of paint, in case you're not familiar with the term) particularly helpful. I once bought a thick, hard-cover book by a renowned airplane modeler that claimed to show how to do all sorts of these finishes - but he never once explained how much he thinned the paint or what air pressure he used! Not so in this book. Not only does Mr. Skinner discuss those details, he provides clear, step-by step photos of the process. (Though I note he doesn't mention using the back of his hand to test the spray pattern�). Though the models used are not sci-fi (well, except for the last one, which uses Moebius Bride of Frankenstein) the techniques demonstrated are certainly universal. Don't let the chapter titles through you off - a gloss finish (for instance) is a gloss finish, whether it's on a car or robot; "pre-shading" is really no different on a modern jet than it is on a Viper or a Valkyrie. 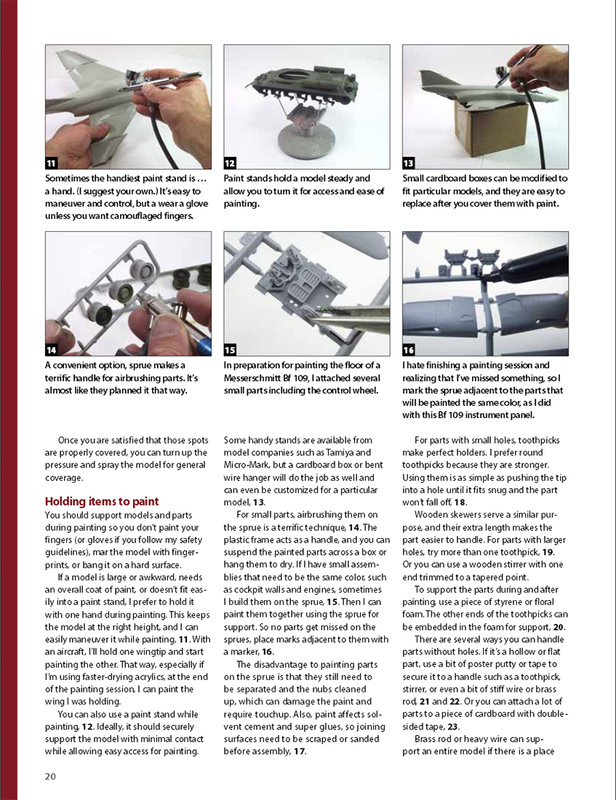 Equally valuable are the incidentals in each project: how to fix blemishes and "oopsies", different ways to hold parts, the effects of different primers, how to decant paint from a rattle-can to use in your airbrush, how to combine techniques. There are a lot of products vying for our hobby dollars. There is a wealth of information available for free on the internet. So why get this book? First, it's comprehensive, well-written and well-illustrated. If you are new to using an airbrush, this is the place to start. Second, it's all there in one place: no flipping through bookmarks, hunting for that one site where the one guy had a bit about this or that detail. 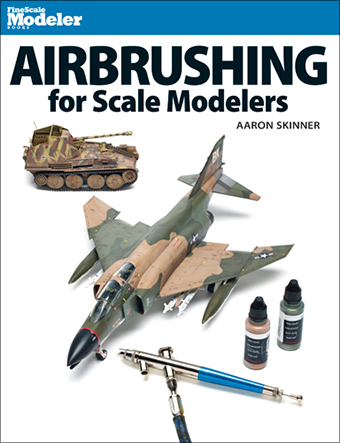 This book will be most helpful to modelers who either have not used an airbrush, or are just starting out. However, there's plenty that more experienced users can learn as well (like me and mottling, for instance). It's a valuable addition to your hobby library - and for less than the price of most kits these days. Many thanks to Aaron Skinner & Kalmbach Publishing Co. for providing the review copy of this book. Manufacturers and retailers, interested in getting your wares reviewed and publicized on a site averaging 6000+ readers a day? Contact us! This page copyright © 2016 Starship Modeler. First posted on 20 January 2016.